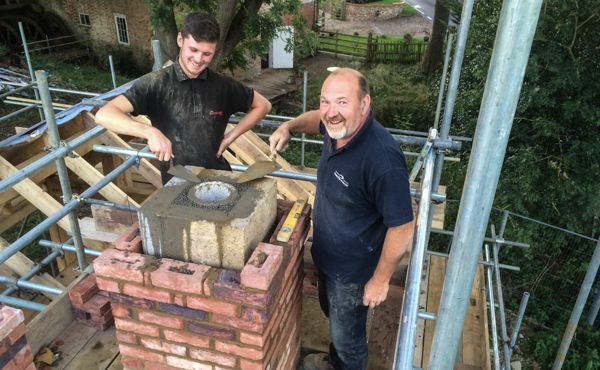 The forge is a chance to try out many of the materials and methods that we will use on the mill. This includes the insulation regime. Here you see a good thick layer of wool lining the walls. What you cannot see is the space age, breathable multi-foil insulation layer just under the weatherboarding. We're already surprised at the difference it all makes to both noise and thermal performance. The outer shell of the two buildings complete. 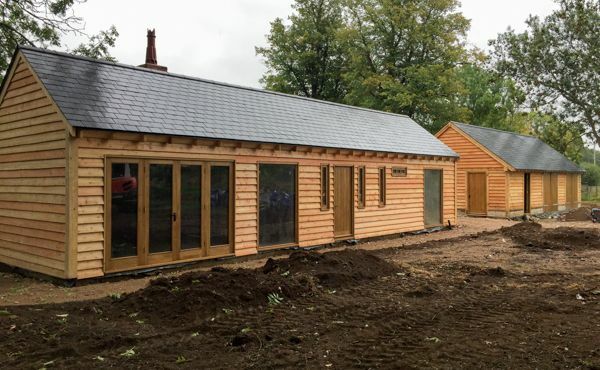 The forge is on the left and the garage on the right. These two buildings are an essential first step that forms our base. From here we can start the restoration of the mill. 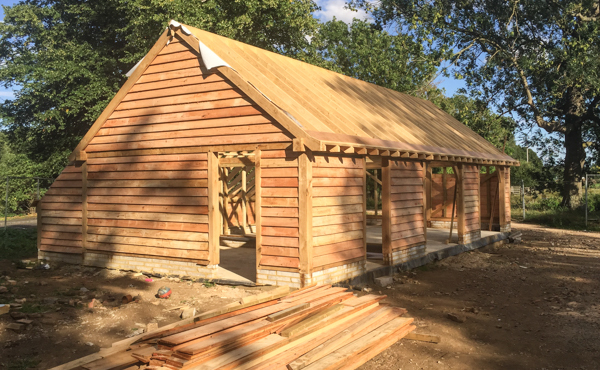 The frame of the forge complete, ready for windows, doors and weatherboarding. 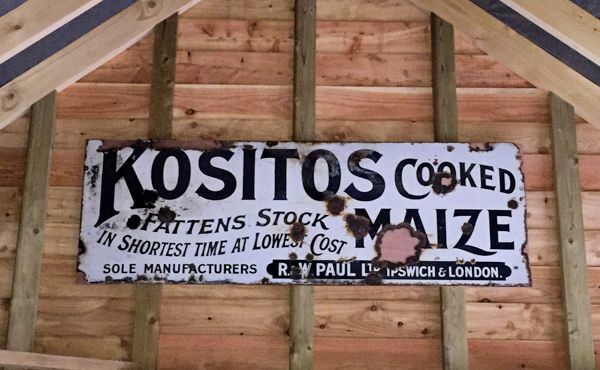 When we found this enamel sign in the mill, it was so dirty that we thought it was just one of a number of sheets of rusty metal. The sign is advertising animal feed from a company called R&W Paul Ltd, an Ipswich based company founded in 1842. The brewery diversified into the manufacture of animal feedstuffs after 1877. The company was eventually sold to the Irish-based agriculture and sugar conglomerate, Greencore. 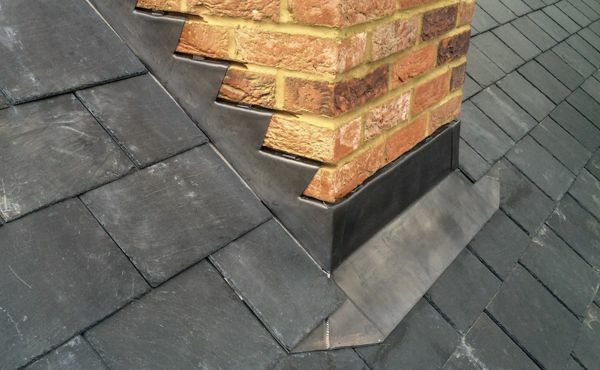 The leadwork around the chimney on the forge is a neat finish to the roof work. The roofs of the garage and forge are slate and have a similar pitch to that of the slate roof on the mill. 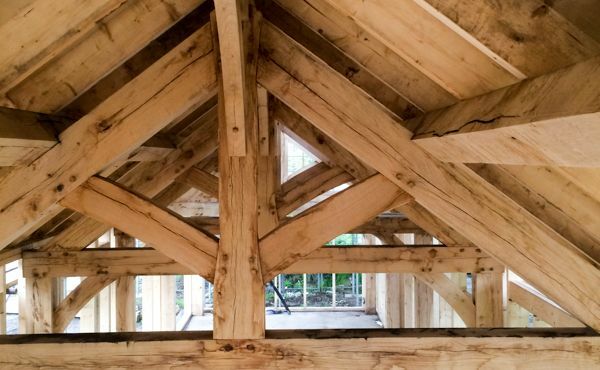 The roof structure of the forge has traditional king posts in keeping with the kinds of timber structures found in the mill. Pumice and Leica. Not their names but the fabric of the chimney. Here's Dave (Ratty) Ratcliffe with right hand man Steve in typical mood getting ready for a well-deserved pint at the Compasses in Greenfield. Here's the garage after the walls, membrane and weatherboard have been added. 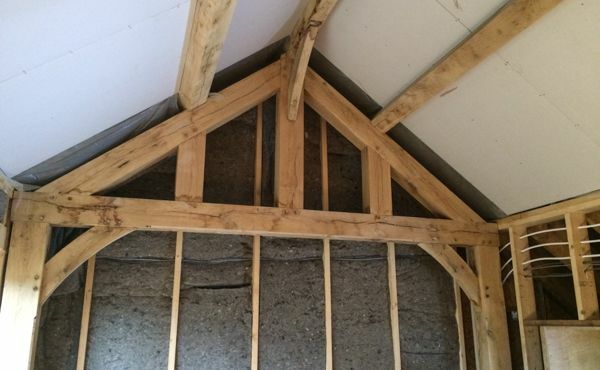 The completed timber frame of the garage. 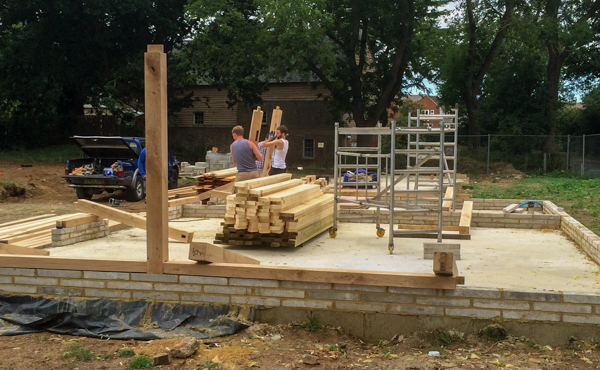 Watch the garage going up thanks to the team from Oakley Framing. Oakley framers work as a well oiled team. They don’t stop but keep up a steady relentless pace moving heavy oak posts and beams. The four of them loaded and unloaded 9 tons of garage materials and drove down from Corby all before 11am. 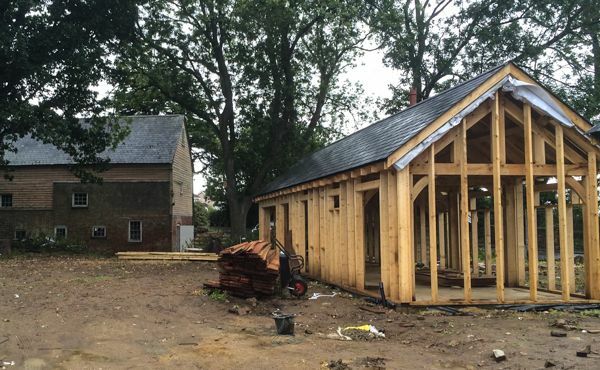 By evening the oak frame was up. 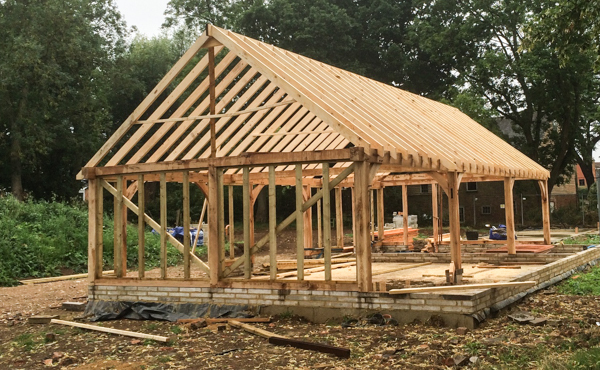 Sharing has a different meaning to timber framers. 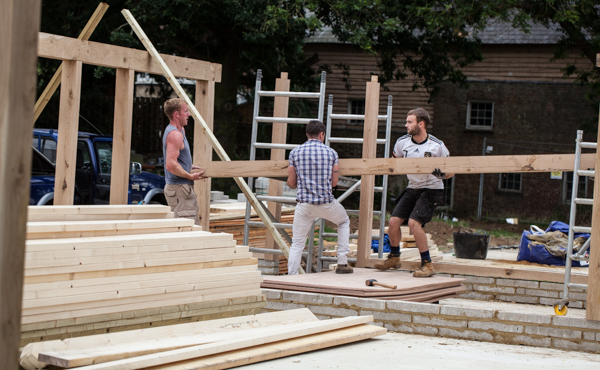 Traditional artisan methods of construction demands good teamwork everyone has to pull their weight and more as they are man-handling big, heavy oak beams. 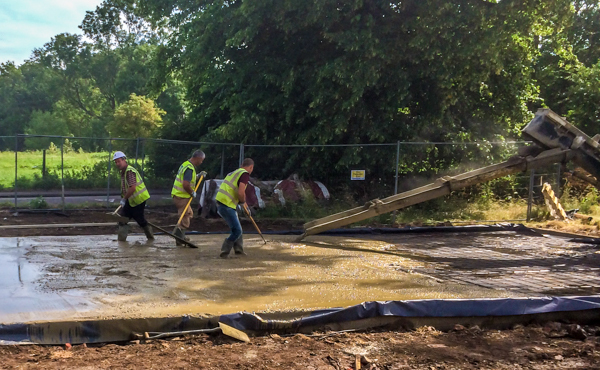 Laying the concrete for the outbuildings.